Cheers! Kate Middleton and Prince William certainly got into the St. Patrick’s Day spirit on Sunday. Per royal tradition, the two marked the holiday by visiting the 1st Battalion Irish Guards at Cavalry Barracks in Hounslow, England. Some 350 soldiers marched on the Parade Square. Kate wore a forest green custom Alexander McQueen dress coat and matching fascinator, paired with black Gianvito Rossi “Piper” suede pumps, a green tourmaline and green amethyst oval drop Kiki McDonough earrings and a gold Cartier three-leaf shamrock emerald brooch, a hand-me-down from Queen Elizabeth II‘s late mom, the Queen Mother. William, who became the first royal colonel of the Irish Guards in 2011, sported the uniform he wore to his and Kate’s 2011 royal wedding. At the event, the two led a minute’s silence to pay respects to the victims of the recent New Zealand mosque attacks. Later during the parade, the Duchess of Cambridge handed out fresh shamrocks to officers, and also gave one to Irish wolfhound and mascot Domnhall, who led the procession. 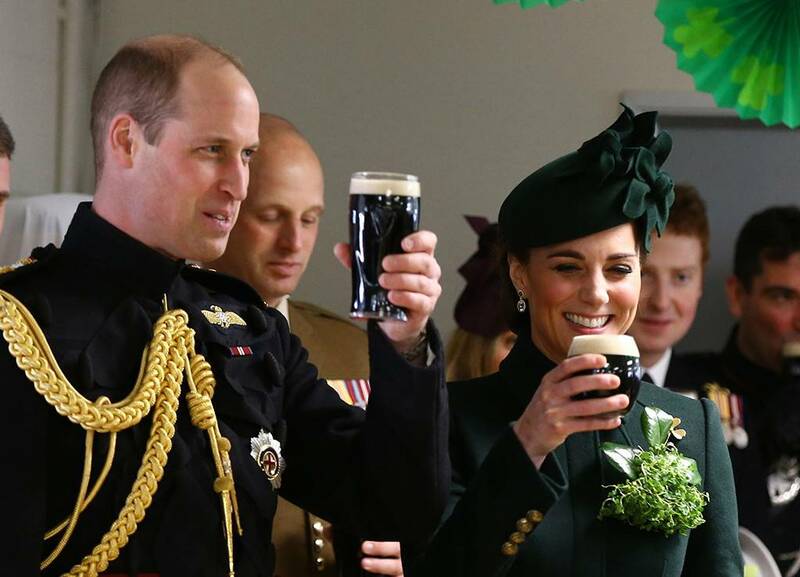 Kate and William later celebrated with pints of Guinness and the battalion members raised a toast to the couple. “Three cheers for the royal highnesses, the Duke and Duchess of Cambridge!” one officer shouted. “Hip hip, hooray!” the group cheered. See photos of Kate and William at the St. Patrick’s Day festivities.